It’s 1893, the modern world is in full swing, and Gustav “Old Red” Amlingmeyer is determined to take a stab at professional “detectifying,” just like his hero Sherlock Holmes. So Old Red and his brother, Otto (a.k.a. “Big Red”), take the only positions that come close – guarding jobs for the railroad. Soon, Big Red and Old Red find themselves trapped on a thousand tons of steam-driven steel, summiting the Sierras en route to San Francisco with a gang of outlaws somewhere around the next bend, a baggage car jam-packed with deadly secrets, and a vicious killer hidden somewhere amongst the colourful passengers. And things aren’t going to get any easier any time soon. Steve Hockensmith has come up with a superb mix of a western and detective story with this, the second book in his Holmes on the Range series. Old Red’s dream of being an investigator like his idol Sherlock Holmes, with help from his somewhat reluctant brother, makes for some very exciting reading, laced with many humorous situations, observations, and comments. Along with the two “Red’s” the book is filled with engaging characters, such as Dr. Chan, Kip, the Give-‘em-Hell Boys, Miss Caveo, and Burl Lockhart, many who may or may not be who they say they are, thus making for a long list of suspects. And it’s not just people who add captivating intrigue to the story, there’s the strange variety of the baggage car’s contents. Not forgetting the trackside discoveries, such as a china cup and toupee that could be the clues that Old Red needs to solve the mysterious events aboard the train. It’s not just Old Red’s “deducifying” attempts that pull the reader into the story, there’s the exciting action sequences too, such as that involving a snake, the train robbery that isn’t, and the final showdown. 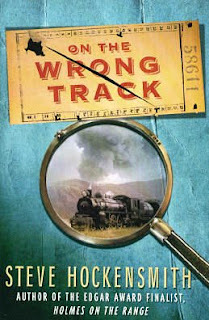 On the Wrong Track has got to be up there with the best books I’ve ever read and has me very eager to read the third one, The Black Dove and get a copy of the first one: Holmes on the Range. The fourth book The Crack in the Lens, will be available at the end of July. Thanks for the kind words about ON THE WRONG TRACK, Steve! Here's hoping you like the other books in the series just as much! I'm sure I will. I'll be reading it very soon.